Summer will be here before you know it, so it is time to decide on all of the special details for your summer wedding. One of the most important elements is your bridal bouquet.The style of bouquet a bride carries should suit the theme of her wedding, her signature colors, and the season. For summer, there are numerous gorgeous fresh flowers from which to choose, each with their own distinctive appeal. Before ordering your flowers, take a look at these five beautiful summer wedding bouquets. One: If classic elegance is your taste, there is nothing better than a lush bouquet of big garden roses. A large bunch of fluffy roses in either white or the palest pink is a feminine and timeless complement to a classic wedding gown. This style of bouquet pairs beautifully with a lace wedding gown worn with a pearl tin cup necklace. The elegance of the flowers evokes the same feeling of gracious bridal style as the classic tin cup necklace design. Wrap the stems with a wide satin ribbon for the perfect finishing touch. Two: Hydrangeas are a great summer flower, and make wonderful bouquets. They also happen to come in shades of blue and green, both of which are popular colors with limited options for flower types. The blue hydrangeas evoke a breezy summer afternoon on Nantucket, and look wonderful loosely gathered into a simple bouquet. A sheer white organza bow is a lovely accent, or play up the New England preppy side of hydrangeas with a striped grosgrain ribbon in white and apple green. 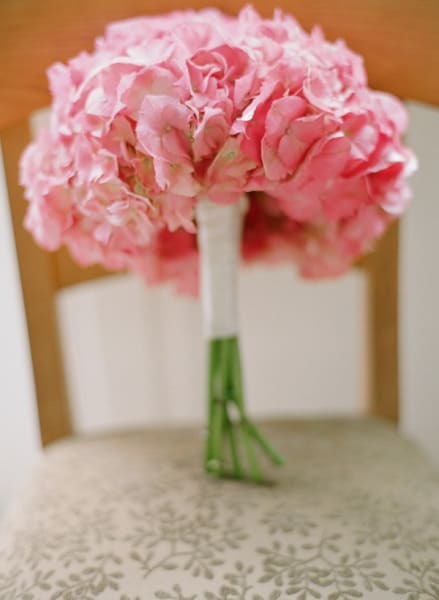 Other pretty color options for hydrangeas include white and pink, and their large blossoms means that it only takes a few stems to make a full looking bouquet. Three: For a casual wedding, bright and cheerful gerbera daisies make a fresh and un-fussy bouquet. They look especially great in a combination of bright colors like yellow, hot pink, and orange. Arrange them into a tight ball, and tie it all up with a ribbon which matches one of the flower colors. This would be a terrific bouquet for an informal beach wedding or one in a state park. The flowers are fun and not overly pricey. Four: Purple is one of the hottest colors for summer weddings this season. Explore the trend with a gorgeous purple bouquet. It can be extremely elegant, featuring purple orchids arranged in a glamorous cascade bouquet. That would be a great choice to carry with a chic one shoulder bridal gown. If you like mixed bouquets, combine pretty purple flowers like lisianthus, iris, and lavender. To increase the drama of any purple bridal bouquet, layer in some fabulous multi-colored peacock feathers. 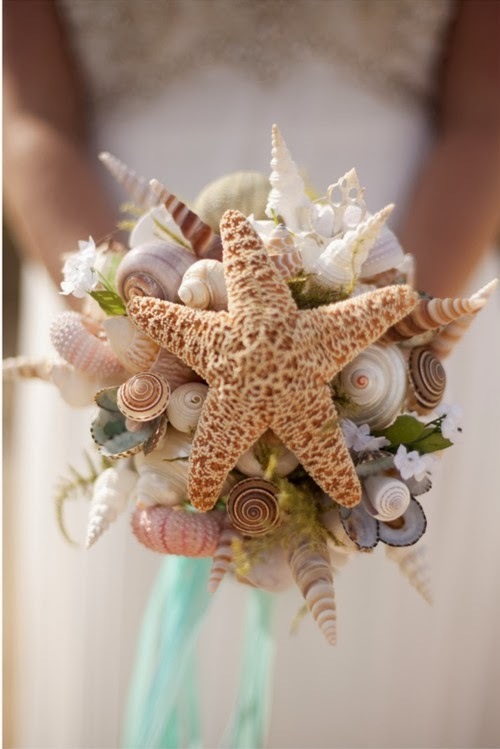 Five: If you are having a beach wedding, have fun adding non-floral elements to your summer bouquet. Custom accents are one of the top looks for wedding bouquets this year, and for a beach wedding, there are some fantastic options. Shells, starfish, and pearls can be wired into your flowers for a unique bridal bouquet which will suit your location perfectly. When using natural non-floral elements in the flowers, a bouquet wrap with an earthy appeal such as raffia will be a terrific material to pull it all together.